Brigade Models – Celtos: Fir Bolg Skeletons with WarScythes – for Kings of War | Azazel's Bitz Box. 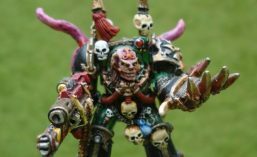 This entry was posted in Fantasy Gaming, Kings of War, Miniatures & Gaming, Undead Army, Warhammer Fantasy - 9th Age and tagged Brigade Models, Celtos, Fir Bolg, Metal Skeletons, Tomb Kings Skeletons, Vampire Counts Skeletons. Bookmark the permalink. Beautifully done as usual, great work! Beautiful paint job. The bone colour hits the spot and the tunics add a bit of colour and contrast. The metal is also well done. Did you consider adding soem rust to the blades? Thanks! I wanted to keep them consistent with the Skeletal Cavalry I painted awhile back, and I tried traditional rust but didn’t like how it came out on them, so I’ve gone for the dark brown/black wash instead as I liked how it worked on the Cav. Nice looking figures, and great paint job. 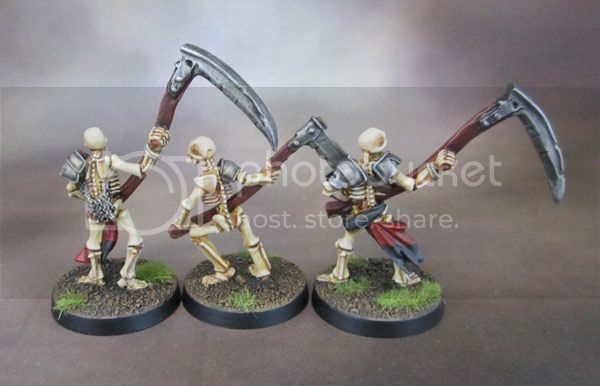 I have some similar ones by Black Tree and some old Citadel metal skeletons with scythes. Which KoW Undead unit do you use them as? I don’t see any unarmoured skeleton’s with 2-handed weapons listed in the KoW undead list? Perhaps just use them as regular skeleton warriors with swords or spears? Alternatively as Revenants which are armoured and can have 2-handed weapons? Thank you! They’ve been used as regular skeletons when a unit needs to be bulked out, but mostly as Revenants with 2h weapons. The Revenant stats just drop to DEF 4+ which is the same as all other skeleton units, after all. Theoretically the game assumes that all skellys are armed and armoured as Mantic’s models, but the beauty of KoW is the ability to swap in appropriate figures without the need to stress about detailed WYSIWYG. I’ve got some other models with mixed swords and spear that would cost me a fortune to turn into two separate units, one armed each way – so the solution I’ll probably use is vary the front rank to the appropriate weapons as needed and the ones towards the rear can be more of a “filler”. Thanks, Interesting options. 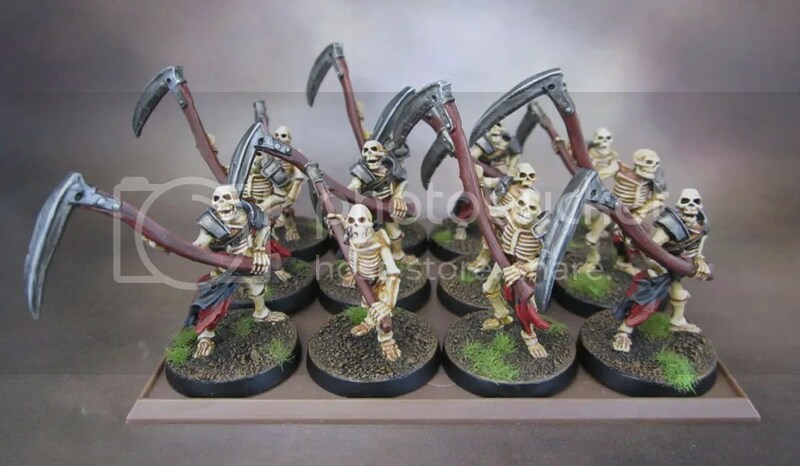 I like the idea of using the skeletons with scythes in the rear ranks of Revenants (for me GW Grave Guard with halberds) to make up the numbers allowing me to field 2 such units. 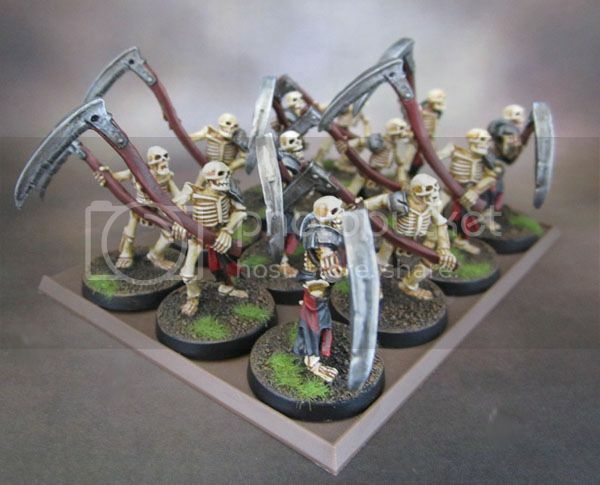 However when I deploy unarmoured skeletons with scythes as a separate unit of 20 figures, I am thinking of creating their own stats, using the DEF 3+ stats as given for skeleton archers (unarmoured) and ME 5+ with Crushing Strength (1) for the two handed weapons. It is probably not legal for tournament play (and won’t work with the KoW Easy Army builder) but as I don’t play tournaments it is not a concern for me. Plus those stats more clearly reflect what my figures are modeled as. To use a GW trope “As long as your opponent agrees” than I can’t see any problem with that. I view KoW units as more of a statline that I can drop any suitable models into than a hard and fast gear-based series of options. My Red Goblin Wolfriders for example are the Space Wolves Wolf Pack without any riders, because for me they fit as big mean “pets” for the Ogres without the need for grotty runts in my force. Similarly before I put a hold to a lot of stuff while they worked out the minutia of KoW 2.0 I planned to use my Reaper Bone Giant with either the stats for the Greater Obsidian Golem or even a unit of Lesser Obsidian Golems since the statline and rules (shambling, etc) worked for an undead giant. Now there’s a “proper” statline to use, but you see what I mean by the example. 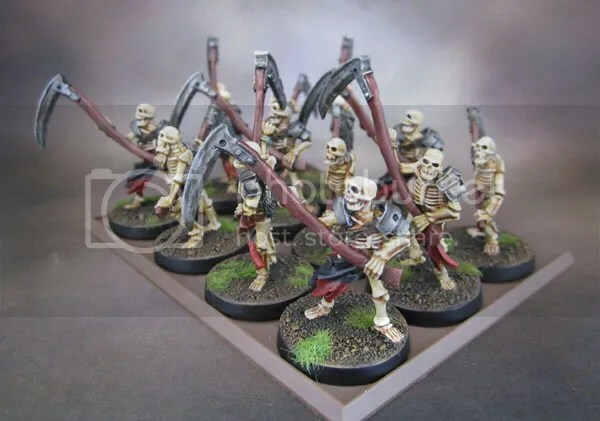 I tend to see if there’s an existing unit entry in another army if I want to field something non-standard, which is often – but of course you’ve got fewer choices for skeletons due to shambling. I get my stats for the Empire of Dust Army from the Easy Army website (they must be using the last Beta version), any idea when Mantic will publish the actual army list or put it online? Thanks the Basiliean/Elohi characters might be a good idea for Thor and Odin, was looking at the , hero stats from army of men list. Download it as an Excel file, because when Mantic publish the book, the Doc will be going bye-bye. (Maybe November for publishing, but I haven’t been keeping updated). The Google Doc has everything, though – and Easy Army also has updated lists. Any idea where I might find a 25mm scale skeleton ox / steer. I managed to get an old Citadel undead plague cart at a reasonable price, mainly because the skeleton ox was missing and a plastic skeleton horse in its place. Perhaps another company makes a skeleton ox? Undead non-horses are hard to find, especially low-key ones like the old Ox. Someone may make something like that, but even after a bit of looking, I have no idea. Reaper makes this – Undead goat with rider (nice model, actually). You could potentially remove the rider and saddle and you’ve still got a 4-legged, horned beast of burden, and I doubt that too many people would worry. You could always cut and pin-reposition the horns if you wanted to. Thanks I will see if my local games shop can order those Reaper figures as I like the look of both. However the shop mainly sells the plastic Reaper figures these days, and say they have trouble getting the metal ones form their distributor due to the extra cost of shipping heavier metal figures. So if they can’t special order them I will have to mail order them from eBay or the company. Another alternative is an Old GW metal skeleton horse, I have 3 with skeleton archers I bought early 1990s, the animals look forlorn (head down) so would work well for a wagon. The archer could be mounted on one of the more active looking surplus GW plastic horses I have or an extra Grenadier metal skeleton horse. Wish they had made saddles on those GW plastic horses as I find it tricky gluing riders made of metal to them due to lack of contact points. 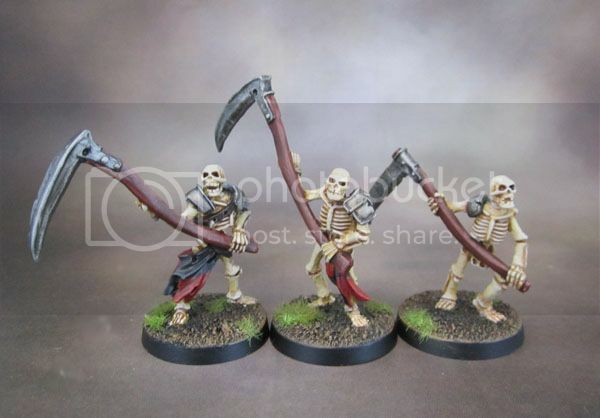 Really like the way you have painted the skeletons, bones look smooth shadows dark enough to show detail and contrast without being too dark and harsh. Looks like you ink wash rather than dry-brush over black primer? Do you have a post on your technique? There’s actually very little ink on my skellies. The technique I use is a bit more time-consuming than a lot of people would bother with for skeletons, but it works for me personally. The equivalents listed aren’t always accurate for the newest Citadel paints, like XV-88 is off. I’ll list the exact colours I use, then add a couple equivalents/alternatives that will do the same thing. 3) Make a paint wash with XV-88 (using saliva instead of water (saliva is more “elastic” and gives more control with a brush (VGC Cobra Leather/Leather Brown/Citadel Snakebite Leather). Stain the entire model with it, and get it in all the crevasses. From this point, paints are thinned down really thin (again, I use saliva) and I try to blend them with the layer I’m going over rather than paint over. 4) Highlight the raised bone with VGC Bonewhite again. 5) Shade the deep gaps with a really thinned down VMA Tank Brown (VGC Charred Brown/Citadel Scorched Brown/Citadel Rhinox Hide(?). I also do key joints with this – elbows, knees, and also between fingers and toes. I’ll cut and paste this into the post next time I finish a batch of skellies. I’ve got those RPE Undead Ogres to work on, but they’re a bit hard to transport to work. Hmmm.. Thanks will give that a try. Similar to what I do with ink washes but using a paint wash and saliva. Pingback: Brigade Models – Celtos: Fir Bolg Skeletons with Spears (6-Month Tale of Gamers Challenge) | Azazel's Bitz Box. Pingback: Brigade Models – Celtos: Fir Bolg Skeletons with Sickles – for Kings of War | Azazel's Bitz Box.